This paper presents the work done as part of a master dissertation on Conservation and Restoration at the Faculty of Sciences and Technology, Nova University of Lisbon. The “Cofre n.º 31” is a French fifteenth century Book of Hours from the Library of the National Palace of Mafra, Portugal. This prayer book, composed by illuminations and devotional texts, was in bad condition due mainly to the rebinding done between eighteenth and nineteenth centuries. According to the assessment of the state of conservation, the main damages observed in the text block and binding were: volume distortion, loose and deformed gatherings, distortion and cockling of folios, and damages in the illuminations. The pigments palette was identified by µ-EDXRF, FORS, µ-Raman and µ-FTIR, which is consistent with the materials used in the fifteenth century. Nevertheless, some particular application techniques such as mixtures and overlays were found, namely in the red colours and specifically in the metallic leaves. Some of these colours also show specific degradation: darkening of the mixture of minium and vermillion; silver tarnishing with strong migration into the parchment support, especially when associated with minium; detachment of azurite, lead white and its mixtures, such as flesh tones and light colours. The main deterioration processes associated to silver and pigments can be assigned to their reactions with humidity and air pollutants, to the grain size of the pigments and to mechanical factors related to the book binding and its use. The presence of different pigments application techniques in different groups of folios lead us to conclude for the existence of a pigments palette with variations, and finally, three different illuminators and two different techniques, confirming the proposals of art history studies. The Books of Hours were books of prayers used in practice of private devotion of laity and their name comes from their main section, the Hours of the Virgin. They were produced in workshops of large urban centers, like Paris, from the thirteenth until the early sixteenth century, giving origin to a class of professionals such as booksellers and illuminators . In the early fifteenth century, the Books of Hours already had great popularity, becoming an indispensable item in the houses of the wealthiest people . The image, an intrinsic component of the Book of Hours, is one of the reasons that led to their popularity: its function was not only illustrative, but rather practical—it marked the sections of the manuscript and articulated their different parts to form the visual identities for the offices which opened out, acting also as a stimulus to meditation [2, 5]. In the case of commissioned books, it also served to insert the commissioner in a sacred space; he/she was represented, usually kneeling and in gesture of prayer, beside the sacred figures, such as the Virgin and Child, reaffirming, in this way, their faith and emphasizing the religious experience as a unique and private moment—therefore, demonstrating one of the main characteristics of a Book of Hours: being tailored for a particular person . The Cofre n.º 31 is part of a set of ten fifteenth century Books of Hours (of which eight are French) belonging to the Library of the National Palace of Mafra, which became part of the collection no later than the second half of the eighteenth century . In the end of the century or right after, the set was fully rebound following the current style at the time, in brown sparkled calf leather with gold-tooling in the spine; a fragile by-pass sewing in raised bands and paper endleaves. Sparkling was also used in the edges decoration of the textblock. The Cofre n.º 31’s current dimensions are 182 × 132 × 38 mm. The manuscript is composed of a calendar in French, for use of Paris , offices and prayers (mostly in Latin, but some in French) sorted in 162 folios; it contains three full-page miniatures with four lines underneath and other seven small illuminations (historiated initials and miniatures), many major and minor illuminated initials, line fillers and diverse decoration in the borders with foliations of golden ivy leaves, stylised flowers and acanthus leaves (Fig. 2a–l). 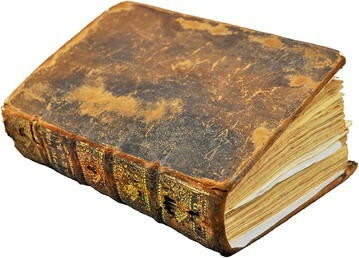 The deteriorated binding could no longer fulfill the function of protecting the body of the book, presenting a strong deformation, a broken sewing, intense ware on the spine and pasteboards, gilding loss, gaps and insect holes, among other damages and signs of degradation (Fig. 1). This set of pathologies, adding to its handling marks, indicates not only a heavy use of this book, but a bad choice as a rebinding option, which has contributed for the degradation of the illuminations. 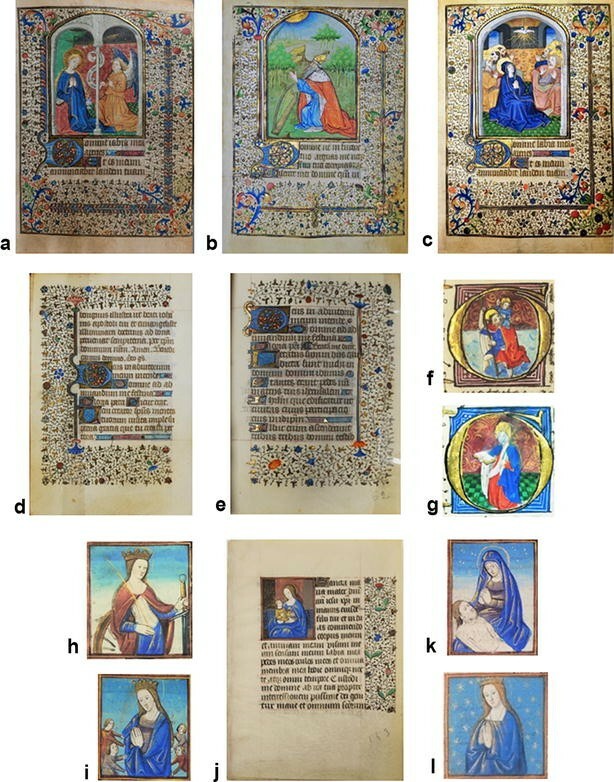 The assessment of the text block was done based on IDAP protocol (Improved Damage Assessment of Parchment)3 [6, 7] and part of the results can be summarized in Tables 1 and 2, standing out the percentage of damaged illuminated folios (89%), even though most of them (78%) can be considered slightly damaged. For the characterization of materials and techniques of the manuscript, as well as the study of the construction of colour and observation of the phenomena of degradation, the following in situ methods were used: optical microscopy, energy dispersive X-ray fluorescence microspectroscopy (µ-EDXRF), fiber optics reflectance spectroscopy (FORS) and Raman microspectroscopy; some micro-samples were also taken, under the stereomicroscope, for analysis by Fourier-transform infrared microspectroscopy (µ-FTIR). The stereomicroscope was also used for observation of the pigments and their application. The three full-page illuminations were analysed (ff.25r, 73r and 91r), two decorated borders (ff.45v and 62r) and three of the historiated miniatures (ff.147v, 153r and 160r), including the various colours and figures present such as the central illumination, frames, initials, text and line fillers, as well as the parchment substrate (its inherent elements and fluorescence were discounted in the pigments analyses). Three measures were taken in each colour area to assure a representative result, and ten to seventy points were analysed in each illumination, according to their size. For most of the pigments, the μ-EDXRF, μ-Raman and FORS allowed an unequivocal characterization and, when necessary, FORS and µ-FTIR were used, as in the case of lakes, its organic additives and binders [8–20]. Equipment details can be found at the Methods section. The writing inks used in the text, in light brown and dark colour tones, are mainly composed of iron, as well as copper and zinc, as indicated by μ-EDXRF analyses; however, according to the recipes used, the proportion of these elements can vary . The analyses of the spectra revealed the presence of three different inks corresponding to three groups of folios, thus confirming three different scripts (Fig. 3). Yellows. 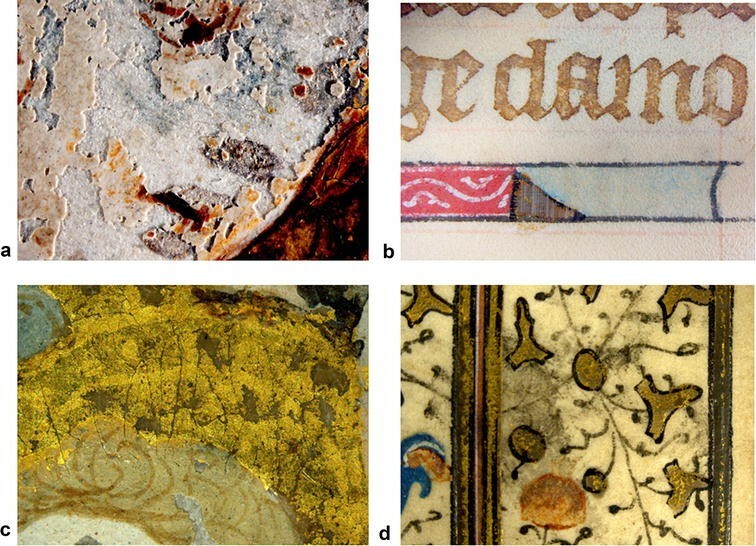 Two types of yellow pigments were used, namely the lead–tin yellow type I (Pb2SnO4), identified by μ-EDXRF, FORS and µ-Raman, present in cloths and details of the illuminations (Fig. 4a, b) and in mixtures such as green and brown; the golden yellow was identified by μ-EDXRF as mosaic gold (tin sulphide) mixed with gold powder, whose grains are visible in the stereomicroscope (Fig. 4c, d). Blue colours. The blues of the illuminations of folios 25, 73, and 91 were made up mainly with lapis lazuli over azurite, identified by all techniques, especially µ-Raman—the first, of a strong symbolic meaning, was usually reserved for the figures of greater relevance —as in the case of the Virgin’s mantle (Fig. 5a–c), though we found it also in the sky (f.73r) and in decorative elements. Other blue tones, such as the line-initials, contain only azurite (Fig. 5e, f); finally, the indigo, an organic dye identified by µ-Raman, was used to darken the blue tones, by creating the shades of the draperies (Fig. 5d), being also used in glazes over the silver. The greens were used extensively, like in the vegetation, drapery and decoration of the margins. Malachite was identified by µ-FTIR through the assignment of carbonate stretching band at 1498 cm−1 and bending at 820 cm−1; and also the double peak at 3365/3315 cm−1 due to OH stretching  (Fig. 6b). Micro-EDXRF indicated a mixture of lead white or lead–tin yellow for the lighter tones. In addition, translucent dark greens were probably made up with the overlaying of an organic lake, as observed in the chequered pavement of folios 25r and 91r (Fig. 6a). The strong orange colour, applied in several elements, is made up of minium, also called red lead (Fig. 7a, b). In red decorations (fruits, foliations etc. ), lead and mercury were detected by μ-EDXRF, which indicates a mixture of minium and vermilion, (Fig. 7c, d). In addition, we also observed the carmine tones, obtained from organic lakes applied over these reds. On the other hand, in f.147v and in the folios added later (ff.153r and 160r), the reds are formed only by vermilion; either in the illuminations, in the decorated margins, or in some ruling lines. The pink and carmine tones are present in a great variety in this manuscript, from the translucent to the opaque, appearing in various elements such as robes, panels, initials, flowers, and others (Fig. 8a–c). These tones come from organic dyes prepared as lakes, to which fillers are added to obtain an opaque colour (see point “Additives”). In lighter tones, lead white was used, as well in mixtures with other pigments (Fig. 8b). Organic lakes, in general, could not be identified through elemental and molecular analyses, but could only be seen through the stereomicroscope. However, FORS analysis indicated an absorbance maxima of 555 nm, which correlates better with the brazilwood lakes reconstructions4 (Fig. 8d) . It should be noted that this was the elected colourant of other Books of Hours of Mafra [22, 23] and of French workshops [24, 25]. On the other hand, the rosy tones of carnations were obtained with lead white in mixture with another pigment, such as the minium identified by µ-Raman in the angel’s face of f.25r (Fig. 9a, b). The brown tones have proved to be very diverse due to the blends of various pigments such as lead–tin yellow and vermilion or minium and writing ink, among others (Ca, Fe, Cu, Zn, Hg and Pb were found). The tonalities of grey are also quite diverse: Pb and Cu were detected by µ-EDXRF, in variable proportions (the darker, the higher the Cu peak), indicating a base of lead white mixed with a copper pigment (a carbon-based black pigment was also probably used, but could not be detected with this technique). In the case of King David’s beard (f.73r), blue grains, mixed in white pigment along with brown ink lines, make its bluish grey tone, observed through optical microscopy (Fig. 10a); nevertheless, further analyses on this colour must be made to confirm the indications of XRF (Fig. 10b). The purple colours show a variable hue, ranging from reddish to violet. The reddish ones, present in some flowers on the borders of several folios, show intense peaks of lead and copper, by µ-EDXRF, indicating a mixture of lead white, azurite and also minium—corroborated by the migration on the verso (see point “Migration of other pigments”), In the case of violet tones, present in some figure’s robes (Fig. 2i, k), lead white and azurite were probably mixed with an organic red, which could not be detected by the techniques used. For whites, lead white was used pure or blended with various pigments to produce lighter tones, such as roses, carnations and blues of the sky, as already mentioned, and also in highlights (Fig. 5e). The black colour, identified as a carbon black by μ-Raman, was applied in the fine lines of contours, some shadows, frames and in the outline of the rinceaux (Figs. 10a, 16b, 17d). Gold, profusely used throughout the manuscript, was applied in two forms: in powder mixtures, both in the elements of the decoration and in the rays, in highlights as well as in other details of the draperies, like the mantle of the Virgin (Fig. 5a, lowerleft, and also Fig. 8a, b); and in admixture with mosaic gold, as aforementioned; the gold leaf, of bright and solid aspect, was applied in haloes, initials, frames, line fillers, ivy leaves and other elements of the borders (Fig. 11a plus Figs. 5e and 10a, among others). Micro-EDXRF was enough for its identification (Fig. 11b). Silver, severely affected by degradation, will be addressed in the “Pigment degradation processes” section. Calcium carbonate (as calcite) was mainly used in grounds (e.g. for gilding) and also as a filler in pigment lakes. Gypsum (hydrated calcium sulphate) was also identified by µ-FTIR (Fig. 12) on the pinks and carmines: the spectrum of carmine colour of the initial background reveals the presence of a carbonate (assigned by 1415 and 874 cm−1 of CO32− stretching and bending, respectively) and gypsum, water assigned by 3394 and 1618 cm−1 due to OH stretching and bending, respectively, and the other bands from the anion sulfate SO42− . Protein and polysaccharide patterns were detected, by µ-FTIR, for the pigment binders in folios 25r, 73r and 91r. However, the absorption bands of binders were masked by ground fingerprints, making their precise identification difficult. The most widely used in medieval illumination were glair, for proteins, and gums such as gum Arabic, for the polysaccharides . The palette of the Book of Hours Cofre n.º 31 is in accordance with the studies carried out on illuminated manuscripts of the period [18, 23, 29]. Figure 13 shows a chart of the pigments and additives identified, along with examples of their application. Table 3 shows the correspondence of analytical techniques used for their identification. The types of degradation found in the pictorial layer are described below, including studies of appearance, colour, elemental and molecular analysis. Some hypotheses for the causes and processes of deterioration are also proposed. Among the different forms of degradation in illuminations of Cofre n.º 31, the silver tarnishing  stands out, appearing associated to other pigments, such as in the dark small flowers of the borders (Fig. 14a), where the element Ag was clearly identified by µ-EDXRF (Fig. 14b). Its oxidation lead to the transformation of metallic shine into a dark and dull colour, changing considerably its original appearance and the reading that is made out of the image [18, 23], namely the windows of The Annunciation (f.25r, Fig. 2a). The analysis by µ-Raman (Fig. 14c) suggested the presence of silver sulphide (Ag2S) [27, 28]. In addition, the Raman analysis has also detected the presence of indigo (Fig. 14d). Another unpleasant effect of this deterioration is the migration of pigments to the verso of the folio, varying in intensity (Fig. 15a); it is possible to observe metallic matter among the parchment fibres (Fig. 15b). According to Guineau et al. , this is caused by the migration of the silver ions. The different applications of silver paints and the mechanism of degradation were studied and are fully explained in another article present in this issue (see Footnote 2). The orange-reddish lead pigment appears in many forms, namely in the round flowers of folios 25r, 73r and 91r, where it is associated to silver and mercury and a carmine lake; the latter and the orange colour are visible under magnification (Fig. 16a, b); some reds mixing vermilion and minium show a degradation in progress, visible in grey shades, such as the strawberries (Fig. 16c), partially degraded and, like in the silver paints, exhibiting a brown colour migration to the verso of the page (Fig. 15a). The purple colour made up of minium also shows a strong migration as seen in the recto of folio 45v (Fig. 16d). As an hypothesis for the phenomenon, we proposed the reaction that involves the minium (Pb3O4) and hydrogen sulphide in air (H2S) producing lead sulphide (II), called galena (PbS)5 , of similar appearance to that of silver sulphide (Ag2S). In addition, some studies about this pigment and its degradation raise the hypothesis of the influence of humidity and binders in colour stability, relating its discolouration to an egg white tempera, probably due to the presence of sulfur [31–33]. All of this evidence shows that we are in front of complex degradations—therefore the continuation of these studies is necessary for the understanding of the involved phenomena. In addition to the migration of silver and minium, other colours can be observed on the backside of the support. The matte look of gold powder, observed in elements such as acanthus leaves and flowers, presents migration of a yellow orange tone (Fig. 15a). A green migration is also observed, originated by copper (identified by µ-EDXRF), associated to malachite and azurite. Generally, these areas present a smooth tone, which is intensified in areas of greater usage and handling (such as the lower right corner). As the other described degradation phenomena, this one needs more studies for its comprehension. The paint loss by detachment, also called flaking, is present all over the Cofre n.º 31, mainly in the blue of the illuminated initials and line fillers, and also in the white and skin colours (made up with azurite and lead white, respectively) of the illuminations, leading to a total loss of pigment (Fig. 17a, b). It occurs also in some small orange and pink flowers (constructed with minium and organic lakes, respectively). This is a continual problem in illuminated manuscripts [18, 33–37], and it is likely due to the poor adhesion of the paint layer to the support and loss of cohesion among its particles, as already indicated in studies of three other Books of Hours of Mafra [22, 23]. It is pointed out by some authors that the grain size of the pigments and the low proportion of binder are the main causes for this phenomenon, especially in azurite, whose larger size is caused by the different methods of grinding the mineral . However, Lawson and Yamazaki-Kleps  suggest that the detachment of lead white is due to the interaction of the pigment with specific binders (gum and glair): according to experimental results, the degradation of the binder is catalysed by basic lead carbonate. This phenomenon could probably explain the degradation of azurite as well, since it is formed by a carbonate. However, the paint loss has been aggravated by mechanical factors, mainly due to an extensive use of the manuscript. The degradation by abrasion of the pigments appears mainly in the gilding, but also in the text (Fig. 17b). In the leaf gilding, the heavy wear eventually left the grounds exposed, like the lines of the frame of the illuminations, ivy leaves of rinceaux and haloes (Fig. 17c); these are fragile areas due to its volume (raised ground) associated to the micrometric thickness of the gold leaf, causing a higher friction. 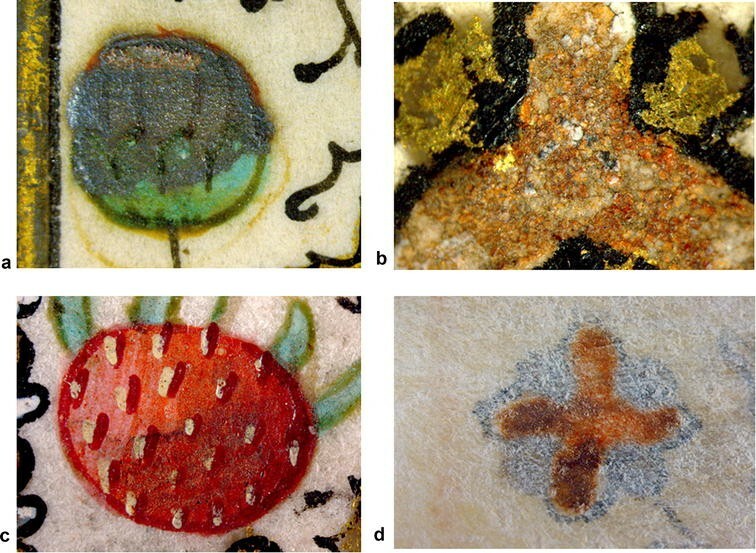 We also found, in several folios, visible areas with dissolution, spreading and smudges due to water-solubility of paints when in contact with moisture, like in the borders (Fig. 17d) and in the historiated initial with the image of Saint Catherine, which had its face blurred (Fig. 2g). The multidisciplinary study carried out in Cofre n.º 31 has revealed essential for the confirmation of the hypothesis raised in History of Art6 concerning the existence of three hands/artists in the making of the illuminations of this Book of Hours. The stylistical analysis of the illuminations led to the identification of three groups, corresponding to the intervention of three different hands, namely: the first group, constituted by the full-page illuminations over a four-line text, the Annunciation (f.25r), David in Prayer (f.73r) and the Pentecost (f.91r), bounded by a similar frame ending with a segmental arch and identical margins with identical decorative typology (see Fig. 2a–c); the second group, formed by the historiated initials of S. Cristopher (f.141v) and S. Catherine (f.147v), with identical decorative typology, measuring 5 and 6 spaces in height respectively, inserted in the text of the Suffrages of the Saints (see Fig. 2f, g); and lastly, the third group, corresponding to a later addition, composed of historiated illuminations inserted in pictures of 7 spaces in height: S. Catherine (f.149r), corroborating a great devotion to this saint by the manuscript’s owner, the Virgin and Child (f.153r) and the Pietá (f.154r), and two others of 6 spaces in height—the Virgin surrounded by four angels (f.155r) and the Virgin in Prayer (f.160r). This third tipology also presents an ornamented border at the right at the text height, and the picture inserted in a pink/purple frame with thin golden bars (see Fig. 2h–l respectively). The results of the scientific analysis of the colour materials allowed us to verify some differences in the inks, pigments palettes and their application, summarised in Table 4. To exemplify them, we can observe that the illuminations of the first group were composed of lapis lazuli over azurite and indigo to create the shades of the robes—but in the figures of the second and third group, only azurite was applied. The difference is accentuated when analysing oranges and reds: in the first group, the mantle of King David is painted with minium and an organic lake (f.73r), and the strawberries, flowers and acanthus leaves of the borders are made of a mixture of minium and vermilion with a carmine glaze of an organic lake—while in the illuminations of the second and third groups, the artists stand out from the first one by using only vermilion in all the reds. Therefore, this approach has allowed us to identify two techniques of pigments application, distinguishing the artist of the first group of illuminations from the other two. The Book of Hours Cofre n.º 31 was studied in its historical and material aspects: a broad diagnosis of its state of conservation was carried out, which included a detailed examination of the parchment and its pictorial layer. The manuscript’s palette was identified, and it is in accordance with the palette already known of illuminated manuscripts of this period. However, this case study reveals the complex construction of the colours to produce the illuminations, namely the application of pigments over silver, such as lapis lazuli, minium and glazes of indigo and pink lakes. The overlays of pigments are frequent, such as lapis lazuli applied over azurite, or mixtures as minium and vermilion. In addition, some differences were noticed in the use of pigments and inks in the various folios analysed, leading us to conclude that there are different writings, palettes and forms of colour application. In face of these results and in line with the studies of Art History, we can divide the illuminations of this manuscript in three groups, corresponding to three illuminators, two techniques and at least two different moments: the original body illuminations (ff. 25r, 73r and 91r), produced ca. 1440 by one hand; the historiated initials of the Suffrages of the Saints (to which belongs f.147v), produced maybe at the same moment or right after, but by another artist, and finally the group of illuminations of Prayers to the Virgin (to which belong ff. 153r and 160r), produced ca. 1490, according to the dates established by Lemos . Concerning the degradation of pigments, the tarnishing of silver changes the appearance of the image, resulting in the opposite of the light effect probably demanded by the artist, and migrating into the parchment so intensely, suggesting that the association of silver and pigments could be an aggravating factor of degradation. A similar degradation occurs with minium, present in small flowers and decorative elements. These phenomena deserve, for its uniqueness, further research by extending it to other illuminated manuscripts and by making reconstructions of these mixtures of silver and pigments. Another form of degradation, more extensively verified, is the detachment of pigments, mainly of azurite applied especially on line fillers, initial backgrounds and flowers—the grain size of the pigments, along with interaction with the protein binding, are the most likely explanations for this phenomenon, but it is also necessary to continue this investigation. Finally, we would like to emphazise that the results obtained with the study of this manuscript are intended not only to be a contribution to studies already initiated on the Books of Hours of the Library of Mafra National Palace and for future researches on this subject, but also for its application in other illuminated manuscripts—particularly the collection of Books of Hours of the National Library of Brazil, institution which stores, since its origin, part of the Portuguese heritage, brought by the Portuguese crown to Rio de Janeiro between 1810 and 1811. Digital microphotography and microsampling were carried out using a Leica MZ16 stereomicroscope (7.1× to 115× zoom range), equipped with a Leica ICD digital camera and a fibre optic light Leica system (Leica KI 1500 LCD). Energy dispersive X-ray fluorescence (µ-EDXRF) was performed in a spectrometer Intax ArtTAX Pro (GmbH) equipped with an X-ray beam of molybdenum in diameter of about 70 μm and a metal detector silicon XFlash®. Conditions of analysis: beam of 300 µA, accumulation time of up to 150 s and helium atmosphere for blue and air for the other colors. This equipment detects elements of atomic number ≥ 13 (Al). Ultraviolet–visible (UV–Vis) Fiber Optics Reflectance Spectroscopy (FORS) was performed in a spectrophotometer Ocean Optics Maya 2000 Pro with metal detector network 2048 silicon CCD array and halogen lighting source HL-200-HP. Range of analysis from 360 to 1050 nm, beam diameter of 2 mm and incidence angle of 45°; sweep time of 8 ms, 15 scans, 5 box width and diffuse reflectance mode with calibration in Spectralon® 99%. Micro-Raman spectroscopy was performed in a spectrometer Horiba Jobin–Yvon LabRaman300, with Olympus objective of 40× and 100×; HeNe lasers with excitation at 633 lines (17 mW) and 532 nm (500 mW) with filter (reducing its power in 90%) were used. Micro-Fourier transform infrared spectroscopy (FTIR) was performed in a Nicolet Nexus spectrophotometer coupled to a Nicolet Continuum microscope with MCT detector cooled by liquid nitrogen; the spectra were collected in transmittance mode with interval of 4000–650 cm−1, obtaining a resolution of 4 cm−1 and 128 wipes in areas of 50–100 μm with recourse to a Thermo diamond cell of compression. Ominic software was used in the analysis of spectra. All equipment belongs to the Scientific Laboratory of the DCR-FCT-UNL. The proposal has contemplated minimal intervention in the text block and restoration of the binding, and can be found in the master’s dissertation cited above . Since the end of this research (2015), studies have been continued by the team of the Conservation and Restoration Department (DCR-FCT-UNL), whose results can be found in the article “Silver paints in medieval manuscripts: a first molecular survey into their degradation“, present in this publication. The IDAP is a more detailed method of assessment focusing the parchment folio, its specific areas and quantification of data (the methodology applied and results can be found in the original master’s dissertation) . Comparing with spectra of historical reconstructions of brazilwood lakes with gum Arabic based on medieval recipes performed by T. Vitorino (Ph.D. student from DCR-FCT-UNL). Galena was identified by Miguel et al. as a result of the reaction of orange of minium with orpiment (As2O3) found in twelfth century Portuguese manuscripts. The results were advanced and presented by Ana Lemos, representing the team, at the IX Jornadas Complutenses de Arte Medieval—“Ver y Crear. Obradores y mercados pictóricos en la España Gótica (1350–1500)”, on November 11–13, 2015 in Madrid (that will be published soon). IC performed the analyses of XRF (data collect, processing and interpretation), FORS and FTIR (data processing and interpretation) under the supervision of RA, as well as the conservation assessment and article writing. RA was responsible for Raman and FTIR data collecting, processing and interpretation, supervising all the analytical and practical tasks and article reviews. AL was responsible for the art history analyses, supervising and article reviews. CC was responsible for general supervising of the study and article reviews. All authors read and approved the final manuscript. The authors are grateful to Joana Bulcão, who helped with the analyses and other tasks as part of her master’s first-year studies; to Aissa Seidi, for the final English language review; to the DCR-FCT-UNL, for all the support; to Mafra National Palace, which lended its precious Book of Hours to be studied and treated; to the National Library of Brazil, the institution that granted the first author a 2-year training permit and funds to study the master’s degree. The authors declare that they have no competing interests. A poster with a similar theme was presented at the Colours Conference in Évora, Portugal, in September 2015; also a communication, including other aspects of the master’s dissertation, was presented at the Fourth Luso-Brazilian Meeting of Conservation and Restoration, held in Rio de Janeiro, in November 2017. Most of the data on which the conclusions of the manuscript rely on is published in this paper and in the master thesis referred below; the full data are available for consultation on request to the authors. This article is a result of a dissertation done for a master’s degree course attended by Isamara Carvalho at the Faculty of Sciences and Technology of the New University of Lisbon, held from September 2013 to October 2015. The National Library of Brazil provided the first author with funding to travel, for the course fees and monthly incomes. The Faculty of Sciences and Technology has covered all the costs of the equipment and staff involved. This study was also supported by the Portuguese Science Foundation through the CORES Ph.D. Doctoral Programme in the Conservation and Restoration of Cultural Heritage with the Grant [SFRH/BD/52314/2013]. Carvalho IL de. Processos de degradação em manuscritos iluminados: estudo, conservação e restauro de um livro de horas do século XV do Palácio Nacional de Mafra [dissertation]. Lisbon: Universidade Nova de Lisboa; 2015. https://run.unl.pt/handle/10362/17113. Accessed 30 Sept 2017. Smith G, Clark R. Raman microscopy in art history and conservation science. Rev Conserv. 2001;(2):92–106. http://discovery.ucl.ac.uk/29386/. Accessed 28 Oct 2017. Araújo AR. Os Livros de Horas (séc. XV) na colecção do Palácio Nacional de Mafra : estudo e conservação [dissertation]. Lisbon: Universidade Nova de Lisboa; 2012. http://hdl.handle.net/10362/9329. Accessed 30 Sept 2017.